Draft: 2008, Philadelphia Phillies, 19th rd. Offensive Substitution: Pinch-hitter Steve Susdorf replaces Kyle Kendrick. July 10, 2014 Lehigh Valley IronPigs released OF Steve Susdorf. March 14, 2014 OF Steve Susdorf assigned to Philadelphia Phillies. October 22, 2013 Leones del Caracas released OF Steve Susdorf. October 9, 2013 OF Steve Susdorf assigned to Leones del Caracas. August 1, 2013 Philadelphia Phillies sent OF Steve Susdorf outright to Lehigh Valley IronPigs. July 30, 2013 Philadelphia Phillies designated Steve Susdorf for assignment. July 25, 2013 Philadelphia Phillies selected the contract of RF Steve Susdorf from Lehigh Valley IronPigs. March 21, 2013 OF Steve Susdorf assigned to Philadelphia Phillies. 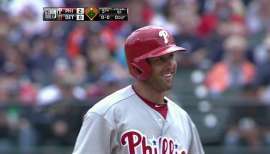 May 19, 2012 Steve Susdorf assigned to Lehigh Valley IronPigs from Reading Phillies. March 15, 2012 OF Steve Susdorf assigned to Philadelphia Phillies. September 23, 2011 Steve Susdorf roster status changed by Reading Phillies. April 2, 2011 LF Steve Susdorf assigned to Reading Phillies from Clearwater Threshers. March 26, 2011 OF Steve Susdorf assigned to Philadelphia Phillies. April 4, 2010 Steve Susdorf assigned to Clearwater Threshers from Reading Phillies. August 7, 2009 Steve Susdorf assigned to Reading Phillies from Clearwater Threshers. June 22, 2009 Steve Susdorf assigned to Clearwater Threshers from Lakewood BlueClaws. May 25, 2009 Steve Susdorf assigned to Lakewood BlueClaws from Williamsport Crosscutters.